1Department of Industrial Engineering, Faculty of Technology and Engineering, East of Guilan, University of Guilan, Guilan, Iran. 2School of Business Management, University of Rahbord Shomal, Guilan, Iran. In today’s competitive business environment, supply chain performance is one of the most critical issues in the various industries; there is much argumentation about the fact that supply chain performance is the basis of the supply chain management efficiency. In this regard, the distribution sector is the most important part of the supply chain. Due to the pulse of a company is in the hands of its sales and distribution department. This article proposes a new mixed integrated linear programming model MILP for scheduling distribution channel membership based on capillary marketing by considering staffs experiences at Pak's pasteurized dairy in one month. The purpose of this study is to reduce the costs of the company along with the increase in sales. Constraints affecting target functions such as minimum sales per employee and maximum overtime days are also considered. The computational experiment by GAMS software demonstrates the effectiveness of the model in reaching its objectives. Safari, H., Etezadi, S., & Morady Moghadam, M. (2015). Maturity of supply chain process 1st; Mehraban Press, Tehran. Ekhtyari, M. (2010). Three-echelon supply chain management under uncertainty using multi objective fuzzy programming. Journal of industrial management studies, 8(18), 123-160. Balfaqih, H., Nopiah, Z. M., Saibani, N., & Al-Nory, M. T. (2016). Review of supply chain performance measurement systems: 1998–2015. Computers in industry, 82, 135-150. Jafarzadeh, A., & Amozadeh, H. (2014). Deigning and controlling supply chain by quantitative approach, 1st. Mehraban press, Tehran. Min, H., & Zhou, G. (2002). Supply chain modelling: past, present and future. Future computers an industrial engineering, 43(1-2), 231-249. Bakhtaiee, A., & Golchinfar, Sh. (2007). Distribution channel management. Tadbir a monthly magazine on management, 18(179). Pashazanosi, L., & Nekofar, K. (2015). Capillary distribution in the industry, challenging and effective strategies to create value added. International conference on management, economics and industrial engineering. Sharify, K., Nesabi, H., & Yavarzadeh, M. (2013). Identifying and prioritizing factors effecting on efficiency of goods distribution network. Quarterly journal of business management, 5(2), 115-130. Shirazi, M., & Alinaghi, A. (1996). A research on industrial distribution network of Iran. Journal of management knowledge, 35 & 36, 39-49. Nooshi, M., Ebrahimi, S., & Parvizyan, J. (2008). The role of intermediaries in e- distribution system: a system dynamic approach. Quarterly journal of new economy and trade, l4 (13), 111 -114. Rizzi, A., & Zamboni, R. (1999). Efficiency improvement in manual warehouses through ERP systems implementation and redesign of the logistics processes. Logistics information management, 12(5), 367-377. Mohammadi, J., Azar,A., & Zareie matin, H. (2005). Designing ahuman resource planning for teaching hospital, case study: Ahvaz teaching hospital. Biannual journal of daneshvar raftar, 12(11), 79-90. Ghazizadeh, M., Amani, J., & Karimi Khosro, H. (2007). Investigation of the Influencing factors on human resource stability. Biannual peer review journal of business strategies, 15(29), 29-40. Shahnazari­_ Sharezaei, P., Tavakkoli_ Moghaddam, R., & Kazemipoor, H. (2013). Solving multi­_ Objective multi_ skilled manpower scheduling model by a fuzzy goal programing approach. Applied mathematical modelling, 37, 5424_5443. Ernst, A. T., Jiang, H., Krishnamoorthy, M., & Sier, D. (2004). Staff scheduling and rostering: A review of applications, methods and models. European journal of operational research, 153(1), 3-27. Edie, L. C. (1954). Traffic delays at toll booths. Journal of the operations research society of America, 2(2), 107-138. Aykin, T. (1996). Optimal shift scheduling with multiple break windows. Management science, 42(4), 591-602. Hertz, A., Lahrichi, N., & Widmer, M. (2010). A flexible MILP model for multiple-shift workforce planning under annualized hours. European journal of operational research, 200(3), 860-873. Hasani-Goodarzi, A., Rabbani, M., & Manavizade, N. (2012). A novel mathematical model for manpower scheduling in break (relief) times in mixed model assembly lines. Procedia-social and behavioral sciences, 62, 1371-1377. Amin- Tahmasbi, H., & Mohseni, M. (2012). Multi objective scheduling of traffic police, case study: Guilan’s traffic police. 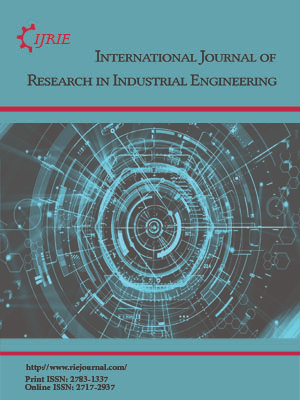 Journal of operational research in its applications, 9(4), 107-120. Asgari, L. (2017). Proposing innovative genetic algorithms model to solve the problem of the professors' educational planning considering students' opinions. Journal of information technology management, 9(3), 531-548. Nasrollahi, M. (2014). Modelling the nurse scheduling in different shifts of BabolsarShafa. Health information management, 11(7), 985-994. Pak Seresht. M., Mahdavi, I., & Shirazi, B. (2015). Fuzzy modeling airline crew scheduling problem and solving by particle swarm optimization. Journal of transportation engineering, 7(1), 1-12. Adem, A., & Dagdeviren, M. (2016). A mathematical model for the staff scheduling problem with ergonomic constraints. Proceeding of the IRES’ 25th international conferences. Istanbul. Vermuyten, H., Rosa, J. N., Marques, I., Belien, J., & Barbosa-Povoa, A. (2018). Integrated staff scheduling at a medical emergency service: An optimisation approach. Expert systems with applications, 112, 62-76. Nazari-Shirkouhi, S., Shakouri, H., Javadi, B., & Keramati, A. (2013). Supplier selection and order allocation problem using a two-phase fuzzy multi-objective linear programming. Applied mathematical modelling, 37(22), 9308-9323. Hochdörffer, J., Hedler, M., & Lanza, G. (2018). Staff scheduling in job rotation environments considering ergonomic aspects and preservation of qualifications. Journal of manufacturing systems, 46, 103-114. Leggate, A., Sucu, S., Akartunalı, K., & van der Meer, R. (2018). Modelling crew scheduling in offshore supply vessels. Journal of the operational research society, 69(6), 959-970. Amin-Tahmasbi, H., & Hami, M. (2016). Using a flexible MILP model for planning multiple-shift workforce and holidays under an annualized hour’s agreement. First international comprehensive competition conference on engineering sciences. Anzali, IRAN. Cai, X., & Li, K. N. (2000). A genetic algorithm for scheduling staff of mixed skills under multi-criteria. European journal of operational research, 125(2), 359-369.